Thirty-seven years after its imposition, and twenty three years after our liberation from the dictatorship that ensued, the Philippines still is haunted by the Pandora’s box that martial law opened. One among the major problems that found full flower during Martial Law and continues to flourish up to now is corruption. This is not to say that corruption was non-existent before Martial Law, but the dictatorship brought it to heretofore unscaled heights to the point that Mr. Marcos ranks second only to Indonesian President Mohammed Suharto in the list of the World’s Ten Most Corrupt Leaders compiled by Transparency International in 2004 – and he was second only because Mr. Suharto was dictator for 31 years to Marcos’ 14. It is estimated that in those 14 years, Mr. Marcos allegedly embezzled between $5 to $10 billion dollars from the country. By the way, Mr. Estrada was in 10th place – making ours the only country with two leaders in the world’s 10 most corrupt leaders list. Now we are in the bottom 10th to 25th percentile as far as corruption is concerned – that is to say, only 10 to 25 percent of the countries in the world are considered more corrupt than we are. The second unfortunate legacy is the politicization of the military – their encroachment into civilian life, the blurring of the civilian-military divide. The practice of appointing military officers to civilian posts started during the Marcos dictatorship, when he would appoint officers still on active military duty to occupy civilian posts simultaneously. The Asian Political News of August 26, 2003 reports that during her term, President Cory Aquino pressed into civilian service 22 retired military officers; President Fidel Ramos appointed more than 100 of them; even President Estrada, during his truncated presidency appointed at least 18, and President Arroyo, since 2001, had appointed 80 to 100. Moreover, since 1987, more than 50 former military men have run for political office. The third legacy of Martial Law that still has not achieved closure has to do with the human rights violations that saw thousands of life damaged, destroyed, or lost. According to the estimates of historian Alfred W. McCoy, 70,000 Filipinos were incarcerated for political reasons during the martial law regime, of whom 35,000 were tortured. McCoy also lists 3,257 extra-judicial killings, of which 77 percent, or 2,520 were the victims of “salvaging.” Add to this the 737 desaparecidos – Filipinos who just disappeared from the face of the earth. Although human rights victims had been awarded $1.9 billion in exemplary and compensatory damages by a US court, and although the Swiss government had turned over to the Philippine government in 1997 about $624 million dollars from Marcos deposits in Switzerland. The sad fact is that the Philippine legislature has yet to pass the bill awarding them compensation and as of now there seem to be two groups claiming to speak for these victims – SELDA and Claimants 1081. This division between the victims has probably resulted in more delay. Like world-class corruption and the politicization of the military, human rights violations like extrajudicial killings, and torture still seem to be part of the modus operandi of our military – with the implicit approval of the executive branch of government. In June 2006, bonnet-wearing armed men forcibly took UP students Karen Empeno, 22 years old, and Sherlyn Cadapan, 29 years old, and a local farmer in Hagonoy, Bulacan. Both students were doing research on Central Luzon farmers at that time and Cadapan was reportedly pregnant then. Until now, the two women are nowhere to be found. Melissa Roxas is luckier. She was released after six days of mental and physical torture in what she believed was a military camp. She and two others were abducted in Tarlac just last May while conducting research for a future medical mission in the area. And, just last month, the Court of Appeals ruled that Melissa’s claims of abduction and torture are “factual and true,” and granted the victim’s petition for a writ of amparo. Actually between 2001-2007 there have been 834 victims of extra-judicial killings. 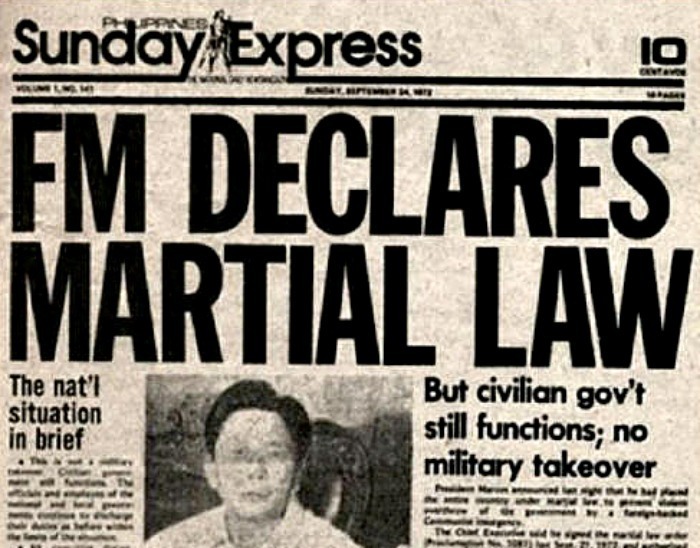 So now that we see how insidious and long-lasting the effects of martial law have been, where its consequences is still reverberating to society and economy is there a possibility that it might happen again? Here, at last, we can end on a hopeful note. The answer is that it is highly unlikely. Firstly, there are enough safeguards in the 1987 Constitution against its imposition a la Marcos. And even more importantly, survey after survey show that the Filipino people are adamantly opposed to it, and do not think that it is the answer to our problems. The same is true for international public opinion.